Umm Yasser, the first Bedouin female guide from the Hamada tribe, looks at Umm Soliman as she plays the flute March 30 near Wadi Sahw, Abu Zenima, in South Sinai, Egypt. 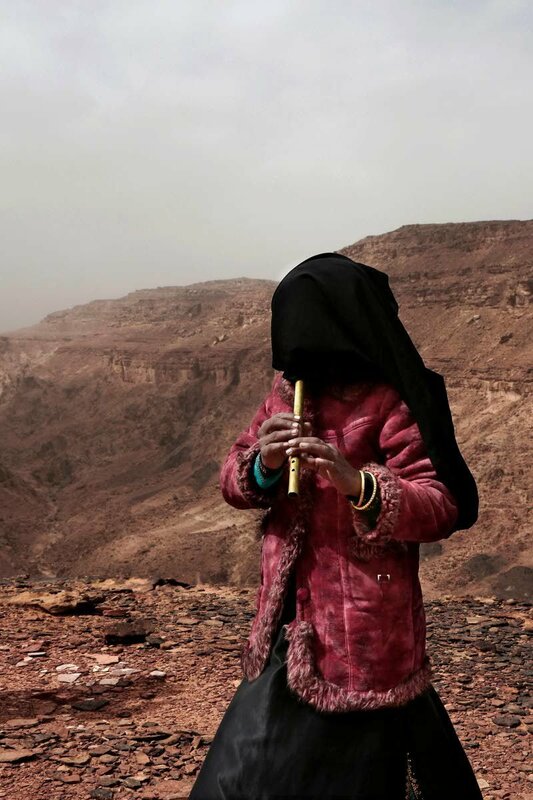 Aicha, an Egyptian Bedouin from the Hamada tribe and one of the first female guides, plays the flute for tourists March 30 on a trek in the mountains, near Wadi Sahw, Abu Zenima, in South Sinai, Egypt. They are part of Sinai Trail, a unique project in which local Bedouin tribes came together aiming to develop their own tourism. Founded in 2015, the project has set up a 330-mile trail through the remote mountains of the peninsula, a42-day trek through the lands of eight different tribes, each of which contributes guides. The project has been successful in bringing some income to the tribes, who often complain of being left out of the major tourism development of the southern Sinai, home to beach resorts and desert safaris. “I think south Sinai is safe especially when you are in the care of Bedouins. ... This is where I feel at home. Every corner there is scenery and another beautiful view,” said Marion Salwegter, a 68-year-old Dutch woman who travels to southern Sinai every year alone to escape the winters in Holland.